4-stage and 5-stage Certified 50 GPD RO systems for use in low pressure or high TDS applications. Use when the water pressure is below 40-psi, when the TDS is high or when more water is needed. 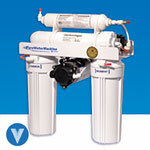 The booster pump creates a pressure of 80 psi to run the RO membrane at peak efficiency. For use in low water pressure situations. Use when the water pressure is below 40-psi, when the TDS is high or when more water is needed. The booster pump creates a pressure of 80 psi to run the RO membrane at peak efficiency. It is placed after the first stage sediment filter to reduce wear from sediment. A pressure switch located on the line to the storage tank turns the pump ON when the tank pressure is 25-psi and OFF when the tank pressure is 40-psi. The pump motor transformer plugs into a standard 110-volt outlet (220 volt available). All other specifications are the same as for the PT-504. 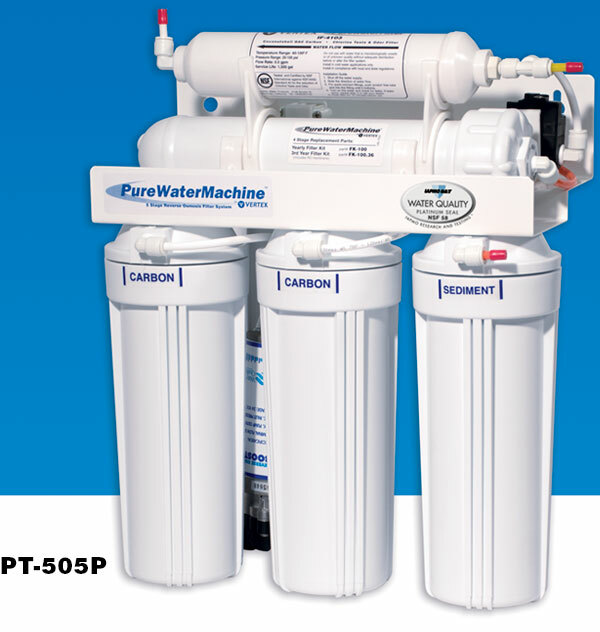 5-stage Combines the IAPMO Certified PT-505 system with a booster pump. The booster pump is placed after the 3rd pre-filter in the 5-stage configuration. 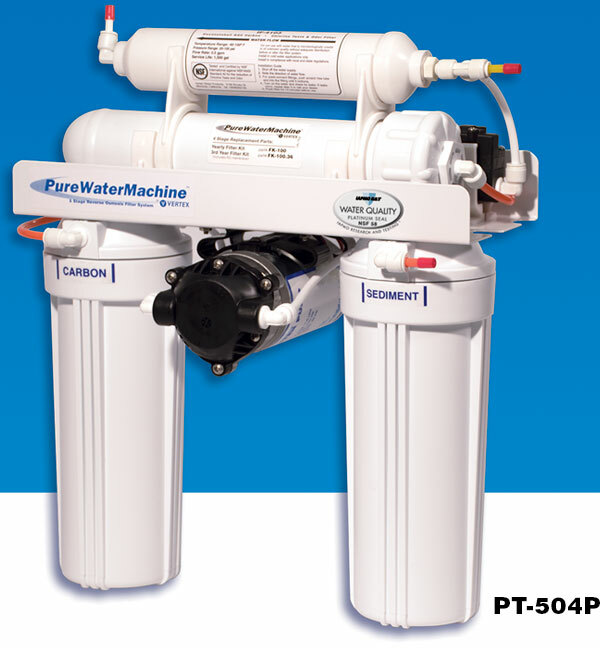 Systems with pump and AutoFlush option can be configured for water up to 4000 TDS. Comes complete and ready to install with dispensing faucet and instruction manual. Add the autoflush option to prolong the life of the RO membrane, especially in areas with high TDS, sediment load and hardness. Each time the pump turns on, the autoflush valve opens to permit full flow to the drain for 20-seconds, flushing the inside of the membrane of any built up contaminants. This reduces plugging of the membrane and ensures efficient rejection of TDS for a longer time. AUTOFLUSH RECOMMENDED FOR WATER OVER 1500 TDS.